Cream Ultraleather upholstery features throughout. Panoramic picture windows around the helm deck. 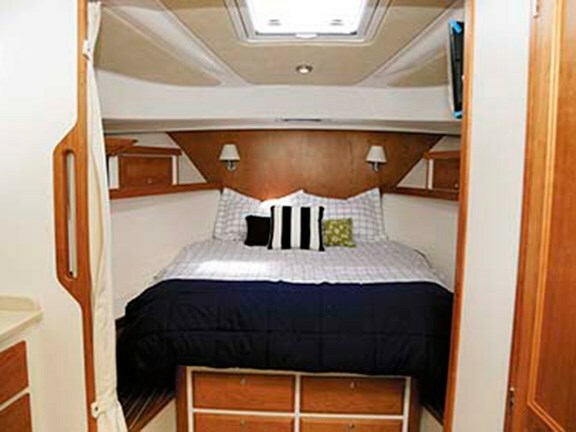 The boat's only cabin is stylishly fitted with soft-touch roof lining, fiddles on the shelves each side of the double beath, plus bedhead lamps to name a few. The galley features a Corion bench top. 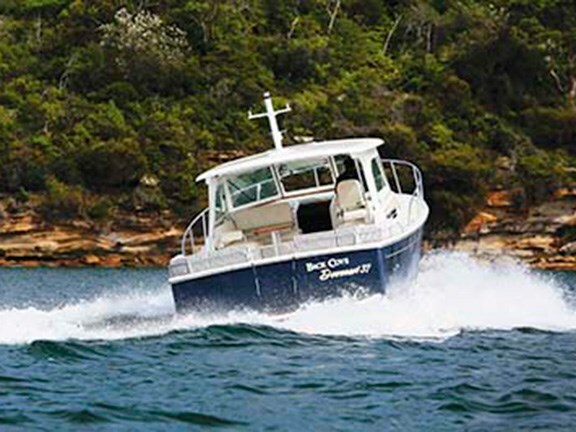 A single 600hp Cummins QSC8.3 can slip the Backcove along at a frugal 7kts or dash to a maximum 29kts. The open-ended cabin top features a roof overhang fitted with an awning that extends to cover and provide protection to the cockpit. The new Back Cove Downeast 37 was hot off the container when John Ford got his hands on it. He found more to it that a simple dayboat and entertainer. 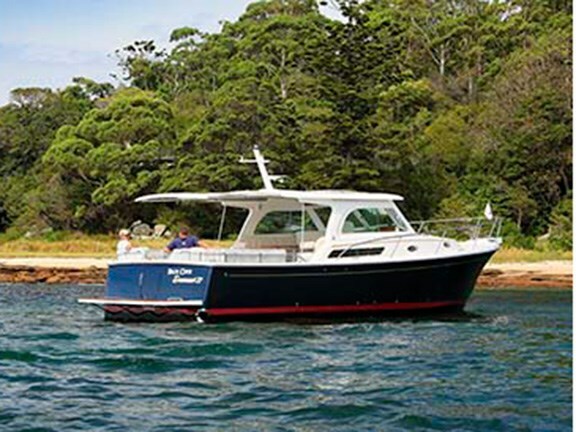 This latest release from Back Cove Yachts has all the flavour of a long boatbuilding heritage and yet the company, a subsidiary of parent company Sabre Yachts, started production at its Maine USA facility only eight years ago. Much of the parent company's experience in producing high-end sailing yachts seems to have seeped into the DNA of the powerboats and blends with design features from the local lobster fishing fleet. 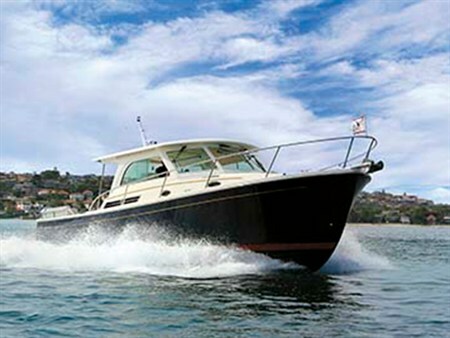 The new boat shares its hull design with the 37 Classic but has completely new topsides with an open, single-level cockpit stretching from the transom to the helm station. Such a layout lends itself to entertaining guests as a dayboat or occasional weekend jaunts for a couple. On looks alone the 37 will win a lot of friends. An elegant sheer line rises to a gently curved spoon bow, while a subtle reverse transom and a hint of tumblehome in the topsides blend to create a classic-looking hull. It's particularly fetching with the white superstructure over a dark blue hull set off by a striking red boot line. Don't be fooled by the traditional looks. 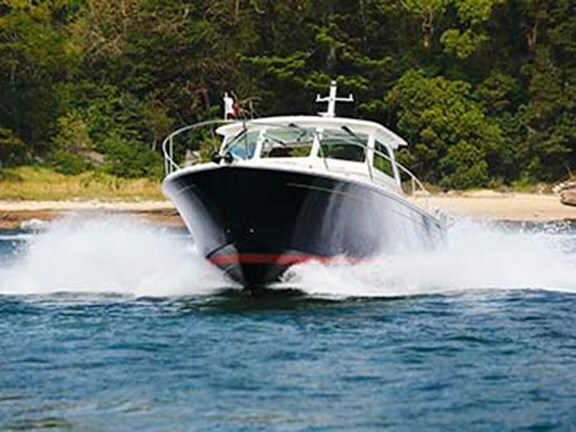 Under the skin it's all contemporary construction and design with leading-edge technology for easy boat handling. Back Cove's Vacuum Infused Process (VIP) draws uniform amounts of resin into the continuous filament mat of both hull and stringers at the same time to give a structurally strong unit with a flawless gelcoat finish. 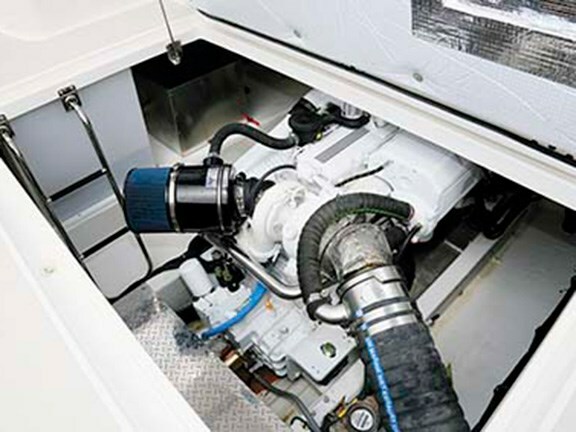 Power is from a single 600hp Cummins common rail diesel that sits low in the centre of the hull for optimum stability and comes with full electronic control and digital data feedback to a dash-mounted display. Modern diesels are proving very reliable and a single engine with this sort of power is a sensible choice as it reduces both initial outlay and running costs. Manoeuvring into tight spaces can be tricky with a single shaftdrive, so Side-Power proportional thrusters are installed to ensure docking is easy and make even novices look good at the helm. 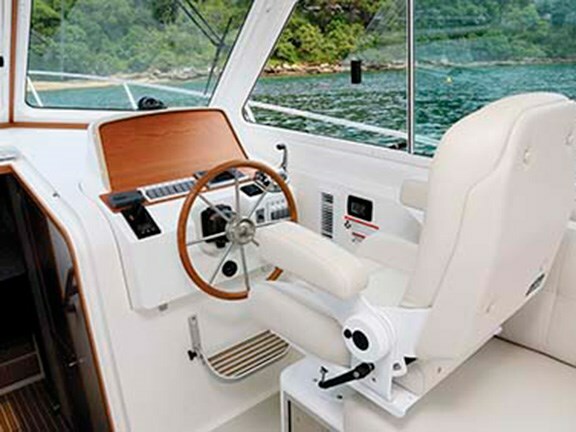 A 'hold' feature of the thrusters allows skippers to dock on their own by pressing the boat up against the dock and leave the helm to secure lines. 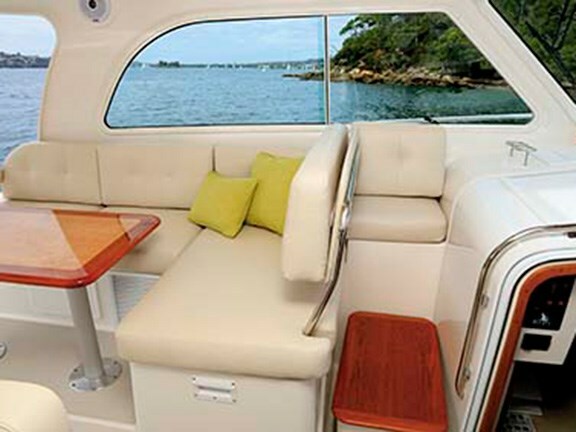 On stepping aboard you will find the open cockpit of the Downeast has room to entertain up to 14 guests. The 3.65 x 3.65m area can be protected from the weather by a canvas awning that extends at the touch of a switch on telescopic poles. 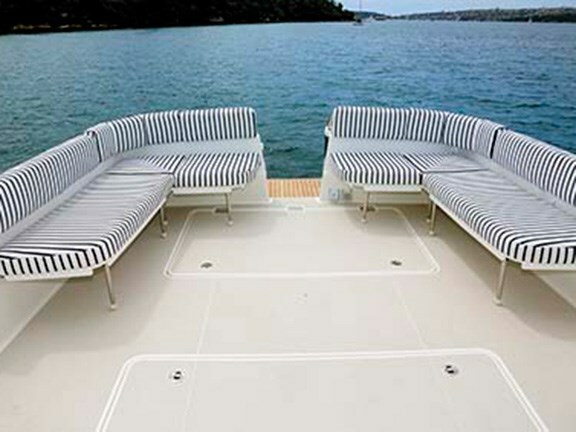 Towards the rear is seating for eight or more on removable side lounges covered in a nautical blue and white Sunbrella material. Back in the cockpit, a large gas-assisted-strut hatch opens to a lazarette with generous storage for water toys, cockpit seats and a barbecue. The separate engineroom is easy to access and has ample space to get around the motor for inspection. A stainless steel Delta anchor rests in a moulded bowsprit and there's a Quick electric winch to haul the rode back onboard and into its own locker under the winch. Aft of this is a second wet locker for fenders, lines and such, and it was deep enough for me to worry about my sunnies falling in, never to be seen again. 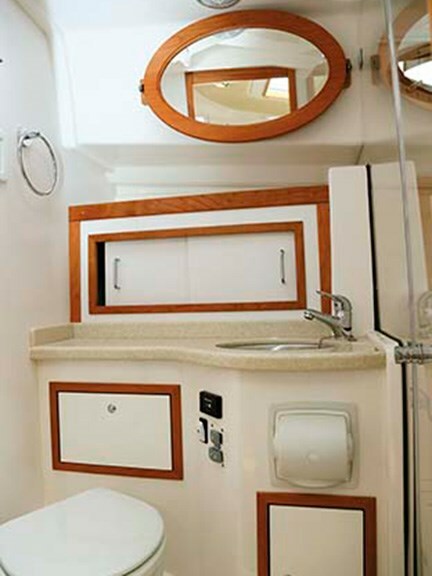 With panoramic picture windows around the helm deck the transition from the cockpit is seamless, especially with the awning extended to cover the cockpit to become one big entertaining area. Or just room for a couple to spread out in peace. Seating under the helm deck roof is raised from the floor to maximise the view when reclining. The port side has a raised platform for a high-gloss cherry and maple table that converts to a double berth with the addition of inserts. Good for occasional guests or a great place to spread out for a quiet read. 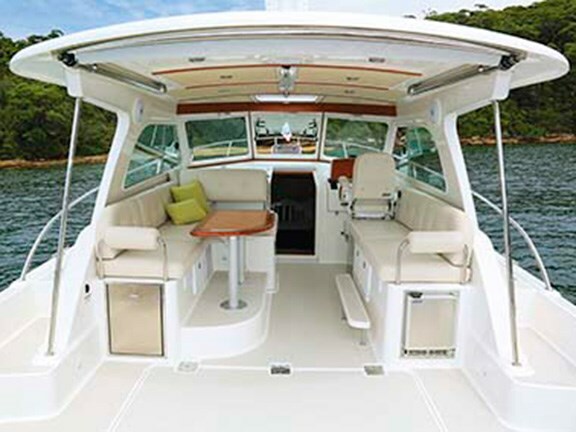 Forward of the port lounge is a twin seat that's easily convertible from forward to rear-facing, depending on whether crew want to socialise or share time with the skipper when travelling. This whole seat lifts for access to a monster hold that extends the full width of the boat under the cabin sole. For something best described as a dayboat there are some surprises downstairs through the lockable sliding door. Three steps took me to a friendly open space with a portside galley, an en suite opposite and a queen-sized island bed crafted into the bow. Back Cove describes the cabin fitout as in the elegant Herreshoff-style of timber sailing boat – and without having been on one, I'll take their word for it. Certainly the clean, white wall panels and solid cherry timberwork create a classic maritime ambience. Light flows from an opening roof hatch and portholes around the sides, all of which have flyscreens and can be blocked out for late sleepers. A soft-touch cream roof lining adds to the muted colours in the bedroom, so the addition of a flag blue bedspread gave a jolly nautical touch and a reflection of the outside colour scheme. I liked the handy shelf with fiddle rail each side of the bed, the dovetailing of the solid cherry drawers and doors in the furniture, as well as the added refined touch of cedar lining in the hanging closet. 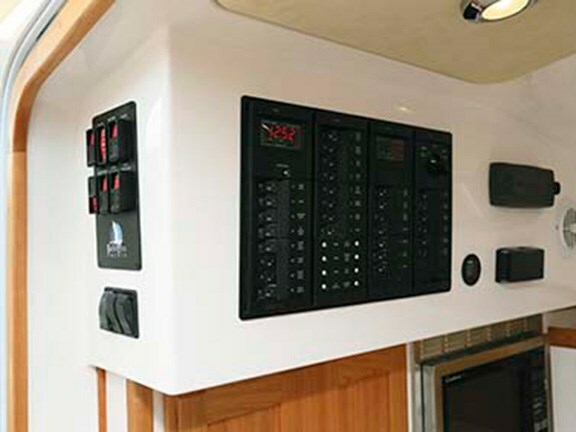 There's a wall-mounted Jensen 19in television and a Fusion radio too, and I also noted dimmable lights and a sliding curtain to separate the bedroom from the galley for some privacy. 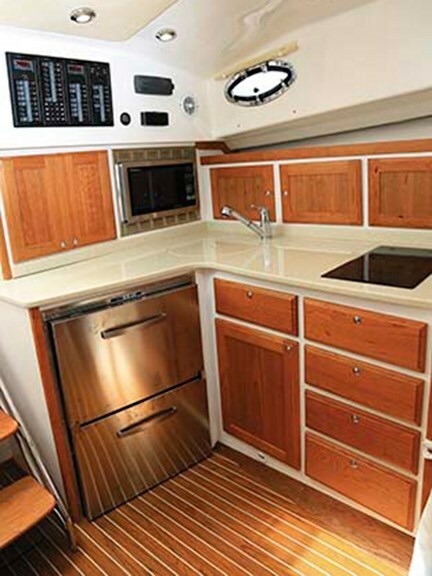 Lots more cherry timber adorn the galley where a two-burner electric stove and a deep stainless steel sink are set into a cream Corian benchtop. Stainless steel fridge-freezer and convection microwave with grill add a modern touch, while light and air flood in from an overhead hatch and side portholes. Weekenders and party people will be pleased to note the second fridge-freezer and icemaker in the cockpit. All around the boat are tasteful, comfortable seating options and stylish joinery, and it was pleasing to see the skipper got the best seat in the house. This high-end Stidd helm chair is covered in cream Ultraleather like the rest, but this is still a seat made for serious voyaging. Set high on a moulded seat box, it commands views in every direction. I couldn't find any height adjustment, instead the footrest slides up and down to accommodate different driver heights and once adjusted, I settled snugly into the supportive backrest. In some ways the seat belies the dayboat personality of the rest of the boat and speaks of heading away for extended voyages. I pointed the bow towards the heads and pushed the electronic throttle into clunkless contact. The first thing to notice was the lack of noise that accompanied the boat's forward progress. All the sound-deadening in the composite floor really works. Even at full throttle the exhaust was muted and any turbo whistle absent. 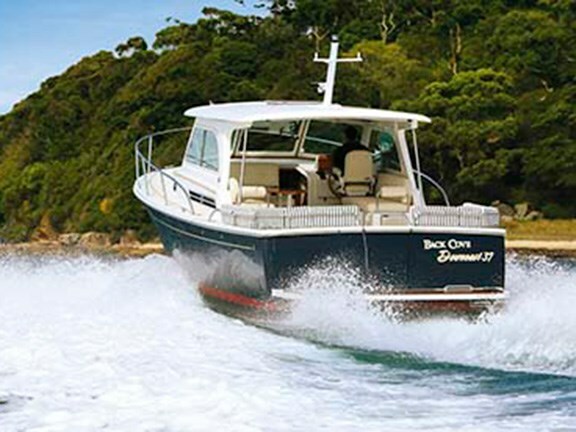 At a cruise speed around the harbour, the boat was a joy to drive; smooth through the worst of the wake, with the automatic trim tabs holding us true and good feedback through the wheel. Burning 68lt/h at 2500rpm and 23kts gave a pretty credible safe range of 345nm. Like all good things, entry to the Back Cove isn't cheap. As tested it's around A$625,000 with options, including the engine upgrade, auto tabs, sternthrusters, electronics package and Ultraleather upholstery. It starts at A$575,000 with a 480hp motor that would still be capable of a decent cruise speed. Not everyone will like the open helm. If that's the case, then the 37 Classic is the answer.